Thank you Oregami Luggage for sponsoring this post. All opinions are my own. To read my full disclaimer click here. If you follow along on Instagram, you know that I just back from a two week trip to Montana, Portland, and Seattle. (Check out my Instagram highlights to see some of our trip!) To say this trip was epic is an understatement. It was by far the most meaningful and amazing trip I have ever been on. Look for upcoming posts all about our trip + travel guides and videos! On our recent travels we brought along our favorite bags to haul all our things. Two large rolling duffle bags from Oregami Luggage was perfect for the three of us! What makes Oregami unique is the built-in packing trays that fold out like an accordion. You can unzip these trays and place them right in the dresser drawer at the hotel. Not only is this super convenient, it also is a little more sanitary. I usually just leave my clothes in my suitcase and not unpack because the thought of putting my clothes in a dresser that is not mine kind of freaks me out. Who knows how often those are actually cleaned out?? It is easier to pack and stay organized ! With the three separate trays, I was able to pack clothes for my Portland and Seattle road trip in one tray, my clothes for the ranch in Montana in another and the third held my shoes and toiletries. It was so easy for me to find what I was looking for! It’s like a traveling chest of drawers! The mesh on top makes it super easy to find what you are looking for before even zipping the tray open. They are crazy durable. I have had a “nice” suitcase that started to wear the second time I flew with it! Our Oregami bags flew from Denver to Montana, thrown in a rental car and traveled to Seattle then Portland and then back to Montana. Then we flew back home to Denver! Not a scratch, tear or blemish. 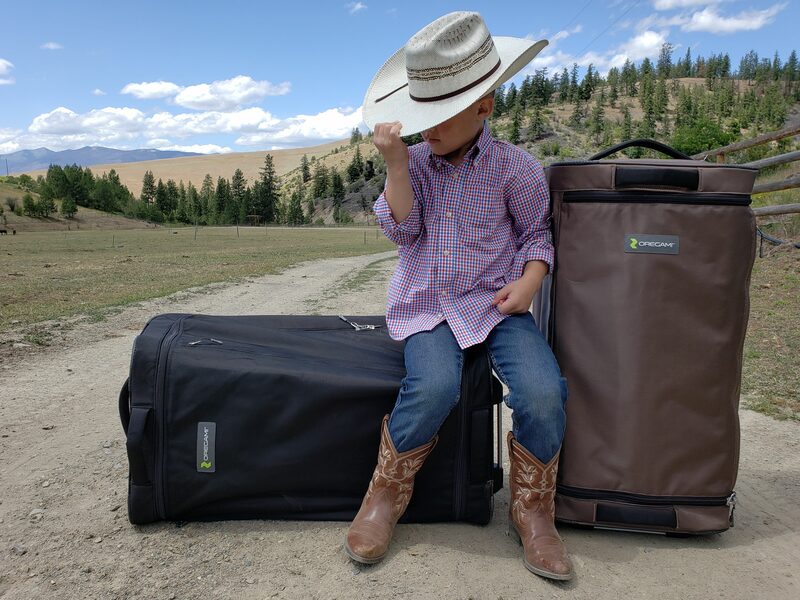 We are super impressed with the quality and durability of these bags. The ABS frame protects your items inside the bag so you can stack them without worrying about your things getting crushed. Quality zippers are a must for a good piece of luggage and Oregami does not disappoint. Not once did my zipper get caught while closing or opening the bag. Smooth rolling wheels are also a must for me and I loved how easy it was to zip through the airport. Two Inside cargo pockets + a large mesh pocket perfect for underwear and socks + a small pocket on the outside of the bag is perfect to separate small items like phone chargers or toiletries. Because of the three separate trays, Nathan and Liam were able to easily share a bag. Two compartments were full of Nate’s things and the third was just for Liam. This made it so easy to just unzip Liam’s tray and leave it in Montana with Grandma while Nate and I headed out on our road trip. Nate fit all of his clothes, toiletries, two pairs of shoes, and our portable hammock in his two trays! Saying goodbye to the ranch until next time! I wore my hiking boots through the airport to save room in my bag and the jean jacket I ended up buying in Seattle I wore home. I had room in my suitcase to still fit an oversized hoodie, a couple of books I bought from Powell City of Books, and could have squeezed in more. I definitely over-packed as I actually didnt end up wearing a couple of tops. It was so hot during the day in Montana and then freezing at night. Seattle was chilly, overcast and drizzling. Not shown is also my rain coat that I had packed too! The bottom tray I had my shoes, toiletries and curling iron. I had plenty of room to squeeze in more items but left it open for souvenirs to take home. Whether you travel several times a year or just once in awhile, investing in a quality suitcase is worth it. You won’t ever dread packing for a trip again! I will be buying the half tray system soon and will show you all how I pack for that! Perfect to fit a sleeping bag/ camping gear on one side and my clothes and toiletries on the other. I look forward to many adventures with this bag and I am already packing for my next trip! Wow!!! That bag is amazing! You could fit just about anything in it. I must have one!!! What an awesome idea for a suitcase! I would never have thought of putting drawers in them. Genius! 1. I am obsessed with this luggage and am seriously going to look into purchasing some. 2. I want to live out of your closet, officially. Thank you so so much !!! That made my day thank you! That is an amazing bag. i love how organised your packing looks! What a cool suitcase:roller. You are so organized and love that you went to a ranch! How fun!! We just did MT/UT/OR last year! I had never owned a rolling duffel bag until I worked on a cruise ship, and let me tell you, it saved my life! Seriously, the cabins for staff and crew are so small, and having luggage that could fit under your bed was a lifesaver. I love how this one is so compartmentalized. This is definitely something I need in my life. I travel a lot and all of these tips were great! Thanks so much for sharing! I love the design of this bag! I have never heard of this brand before, but I’ll definitely check them out since I’m traveling more! I love how big that is and how much stuff you can put in it. This would be perfect for kids. Oh, WOW! This is the dream travel bag. It looks quite tall, but look at how organized and spacious it is! Is it fit as a hand luggage or a check-in one for airplanes? Hi nat! i love all the different sections! For me having a way to organize is so key when packing. The rolling is a total bonus. No more trying to lift and carry heavy bags…just pull and go! OMG, where has this been all my life. This has to be the most perfect luggage ever! I’m going to their site now and check it out. Thanks for sharing! Such a great suitcase! I love those compartments – what a great way to travel! I love how organized and easy this suitcase is! Besides being totally fascinated by yor packing skills, I like that this piece has two smooth rolling wheels and the small pocket outside of the bag where I can put a book, some water and snacks!